The RV-12 kit as shipped from the factory has no provisions for a parking brake. I understand Van’s is trying to keep builder costs down and to a lesser degree, perhaps weight. However, one would think in today’s day and age there would at least be a parking brake option ... sadly none is offered. A parking brake is not complicated, in fact, it is simplistic ... it is just a valve attached to a pull lever. To set the parking brake, the brakes are applied and the parking brake’s lever is pulled. This rotates a valve that prevents the applied pressure to the brakes from releasing … thus keeping the brake pads compressed onto the rotors, keeping the brakes applied. While at this stage of the RV-12 project, since the RV-12 is being built under E-AB rules, feel it would be totally daft on my part not to incorporate the instillation of a parking brake while access is easy. Yes, there have been some inventive designs for control stick gust locks which incorporate pushing on the brake pedals as part of the rudder lock. This is fine, but hardly worth the time and effort needed to dig out the gust lock from the baggage area, install and adjust it just to make a quick fuel stop ... or to go inside a FBO for a restroom break ... or to procure refreshments. The Matco PVPV-D parking brake comes to the rescue. 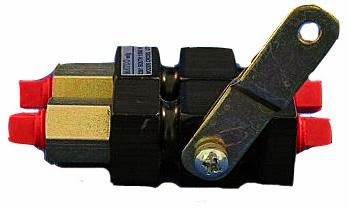 Photo of the Matco PVPV-D dual parking brake valve. One of the reasons the brake lines have not been installed yet on the rudder/brake pedal assembly was due, in large part, to wanting to install better quality brake lines on the RV-12 other than the plastic tubing Van’s supplies with the kit. From following the forums, I knew Aircraft Specialty as working on offering a brake line kit for the RV-12 made from Teflon hose covered with stainless braid and coated with clear vinyl. Sign me up! The DOG Aviation procurement department contacted Steve at Aircraft Specialty and requested a brake line kit that will connect to the Matco parking brake planed for the RV-12. This was around the beginning of May if I recall correctly and Steve told me they were putting the finishing touches on a kit and that the brake lines were currently being fitted onto a test RV-12 to verify fit. As it turns out, DOG Aviation has taken possession of Aircraft Specialty’s first complete RV-12 brake line kit for customers desiring Vinyl coated, Teflon and stainless brake hoses which will interface to the Matco PVPV-D parking brake. First impressions …. the kit contains extremely high quality hoses complete with all the fittings necessary. The quality of the materials and workmanship is outstanding. Steve even screwed the fittings onto both ends of every hose so there was no question as to which fitting should be used with a particular brake line. A nice touch and shows good consideration for Steve’s customers. Of course, it will be many, many months until the hoses are filled with fluid so won’t know if they will leak … but judging by the way they look, seriously doubt there will be any issues. The complete RV-12 brake line kit offered by Aircraft Specialty … Teflon hoses covered with stainless braid and coated with clear Vinyl. The two larger diameter hoses on the left with red caps are the brake lines that will run down the landing gear legs to the wheel brakes. In the center is the Matco PVPV-D parking brake assembly. Because the bulkheads are already assembled and the bottom skin installed, it did not seem prudent to take a chance on attempting to increase the diameter of the holes in the bulkheads to accept through fittings for the brake lines. Too much can go wrong at this point making the risk far overweigh the reward. As such, the DOG Aviation RV-12 will still have a small section of plastic brake line running from the Matco parking brake through the center tunnel to the fittings for each gear leg’s brake line. This will be OK because this line does not move and is not exposed to the sun or elements. I suppose most current RV-12 owners retrofitting their RV-12’s will do the same thing. The main thing is all of the brake lines that connect to the moving rudder/brake pedal assembly or are outside the aircraft’s fuselage and exposed to the elements will be the new Teflon hoses covered with stainless braid and coated with clear Vinyl. Installing one of the hose fittings into one of the Matco master cylinders using Loctite 567 thread sealant. Completed rudder/brake pedal assembly now ready to install. Note: For completeness, the not yet installed round brake fluid reservoir was included in the photo so the reader can see how Aircraft Specialty’s brake lines interface to it. Also of note … the above photo shows the Matco parking brake valve and how the two brake lines with yellow caps will attach to it. The Matco parking brake will be installed sideways near the top of the F-1217A right tunnel rib just below the tunnel’s cover plate. The exact position will be determined after the rudder/brake pedal assembly is permanently mounted ... but it appears it will be located above the cross brace.